To quote Keanu Reeves from practically any movie…whoa. Gilliam, Terry, dir. The Zero Theorem. 2013. Film. 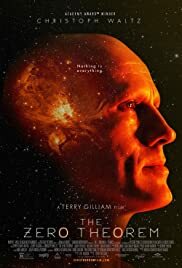 I’ve seen Brazil, and Twelve Monkeys, and pretty much everything else that Gilliam has created, because (like one of the Bobs from Office Space) I have to tell ya, I’m an honest to God Michael Bolton Terry Gilliam fan! So I went into The Zero Theorem with high expectations, not only for something visually lush and quirkily entertaining, but also something measurably different from the rest of Gilliam’s oeuvre. The first two? Check. The third? Not so much. And thus my reaction to the film resists easy polarization into the totally ‘love’ or ‘hate’ categories, and ends up somewhere north of the middle. 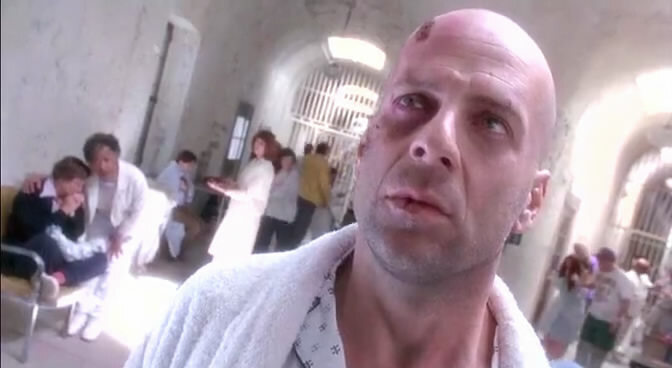 First of all, Gilliam still seems stuck—or to be more charitable, has chosen to remain mired—in the dingy yet somehow impossibly vibrant dystopian world-building/exploring he began with Brazil and continued in Twelve Monkeys. Indeed, The Zero Theorem is sometimes described as the tragic conclusion to the other two, forming a dystopian trilogy of sorts. Despite the heavy debt Gilliam acknowledged to La Jetée in Twelve Monkeys, that film visually, and certainly cinematographically/editing-wise, resembled Brazil to a surprising degree considering how different the narrative content is. Perhaps then it is no surprise that The Zero Theorem, despite no acknowledged debt to any other film or source, feels at times like an eerily close cinematographic echo of Twelve Monkeys. Space is hella cold, brah! That's weird, I thought the only one who looks like me is Joseph Gordon-Levitt! What’s wrong with that? You might be wondering, and in general I agree—Twelve Monkeys was a glorious and entertaining film, so Twelve Monkeys 2.0 might be wondrous indeed. Unfortunately, The Zero Theorem feels more like Twelve Monkeys 0.7, if that makes any sense. Much like Ozu Yasujiro’s Ohayo (Good Morning) versus Umarete wa mita keredo...(I Was Born, but…) (since if the latter had never been made, Good Morning would probably be accepted as the comedic masterpiece par excellence of the great Japanese auteur), if there had never been a tragicomic tour-de-force like Twelve Monkeys (or, arguably, a Brazil) this film would have elevated Gilliam to full-on auteur status, and people would be writing their dissertations on its use of color or its Marxist dystopian vision or whatever. As it stands, though, it just feels like a slightly weaker echo of the earlier work. Still, I enjoy hearing echoes of things I love, so it’s certainly fair to say that The Zero Theorem is worth watching, and an enjoyable experience both to see and to contemplate afterwards. The cast, led by Christolph Waltz, is absolutely fantastic (my favorite is the werewolf from Harry Potter! ), and the script is witty enough, to be sure. You just shouldn’t expect the same level of stunnitude as came from Twelve Monkeys or Brazil. Yes it has, Fin Raziel--yes it has.